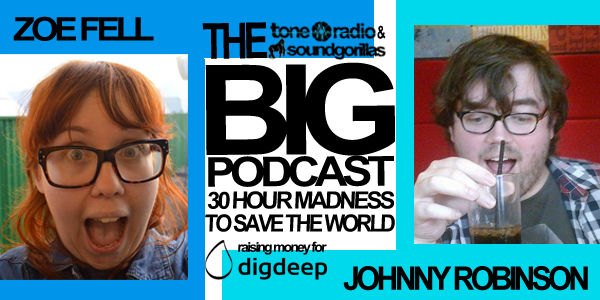 On June 5th to the 6th Johnny and Zoe from the Prick Up Your Ears podcast did a 30 hour podcast called “The Big Podcast”. They teamed up with Tone Radio to make a mess in the studio and raise some money for charity. It was streamed live on Tone Radio to raise money for Dig Deep who are busy folks breaking the cycle of poverty through water and sanitation in rural Kenya. DONATE NOW!!! – the podcast may have finished but you can donate until the 13th of June 2015. Listen below to listen to the whole podcast, or download from iTunes here.